Separated by only a mere 12 kilometers wide strait from Fuerteventura, is the northeastern of the seven major Canary Islands: Lanzarote. As the home of the artist and environmentalist César Manrique, its design was significantly influenced by him. The emergence of the island of volcanic origin goes back about 36 million years. In 1993, it was declared as the first whole island a UNESCO Biosphere Reserve. The approximately 58 kilometers by 34 kilometers large island is home to over 140,000 people. The airport of the capital Arrecife provides the main traffic connection. The total of 213 kilometers of coastline is mostly rocky coast with 10 kilometers of sand and 16.5 kilometers of pebble beach. About 140 kilometers separate Lanzarote from the Moroccan coast and about 1000 kilometers from the Spanish mainland. César Manrique Cabrera was a Spanish painter, architect, sculptor and environmentalist who lived in Lanzarote from 1919 to 1992 and contributed significantly to the design of the Canary Islands. In 1968, he convinced the president of the island administration Pepin Ramírez, a friend of his, to prevent any building on the island to be buit higher than three floors – the height of a full-grown palm. Although this regulation was later softened a bit, it has largely preserved Lanzarote from mass tourism. 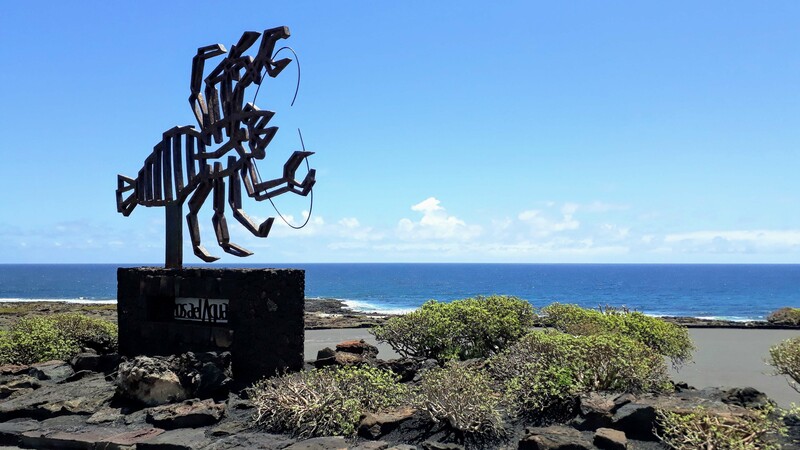 Jameos del Agua is the first center for art, culture and tourism founded by César Manrique and for many the paradigm of its aesthetic ideology: the harmony between nature and artistic creation. The word Jameo comes from the natives and refers to a hole created as a result of the collapse of the roof of a volcanic tube. The Jameos del Agua are like the Cueva de los Verdes within the volcanic tunnel created by the eruption of the Volcán de la Corona. The tunnel has a known length of 7 kilometers, of which at least 1.5 kilometers run below the sea surface. 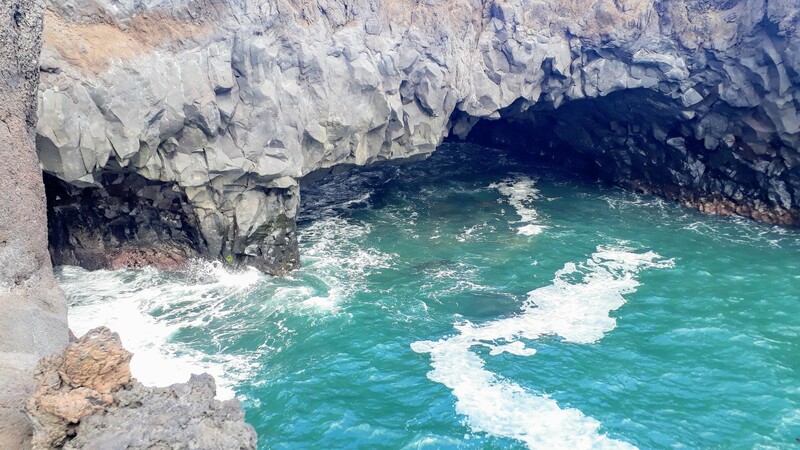 The Jameos del Agua are located in the section of this tunnel closest to the coast. It consists of at least three jameos or openings: Jameo Chico, where access to the interior takes place, Jameo Grande and Jameo de la Cazuela. It is a spatial intervention created by the Lanzarote artist César Manrique out of this natural jameos and is intended to show the visitor a space for the contemplation of nature, which is hardly intervened by man. The Jameos del Agua are very important from an ecological point of view, as there lives a unique and endemic crab species, the Munidopsis polymorpha: a mere 1 centimeter long, blind albino crab. These crabs are very sensitive to changes in the seawater lagoon and are affected by noise and light. They are also very sensitive to rust, which can kill them. Therefore, it is forbidden to throw coins into the water. Insider tip: From 15 o’clock the entry is 20 percent cheaper! The César Manrique Foundation is a private cultural institution founded by Manrique himself, inaugurated on March 27, 1992, six months before the death of the artist. Its goal is to protect and spread Manrique’s work. It is located in the former house of the founder himself converted into a museum. Manrique designed it on his return from New York, when he decided to settle definitively on Lanzarote. The building was built on a lava flow created by the large volcanic eruptions between 1730 and 1736. The style is inspired by traditional island architecture. In addition to the living space built on the surface, there are rooms in five natural volcanic bubbles connected by tunnels carved into the lava. César Manrique lived here for 20 years: from 1968 to 1988. The Mirador del Río is an approximately 475 meter high viewpoint in the north of the island, which was also designed by César Manrique. At the time of its completion (1974), it was considered one of the most important modern buildings in the world. In the typical Manrique style, it is integrated into the rock and consists of a parapet over the precipice, a café with large panoramic windows, a souvenir shop and a viewing platform. Right angles were completely omitted: all rooms are round, including the parking lot, the observation deck and the stairs. 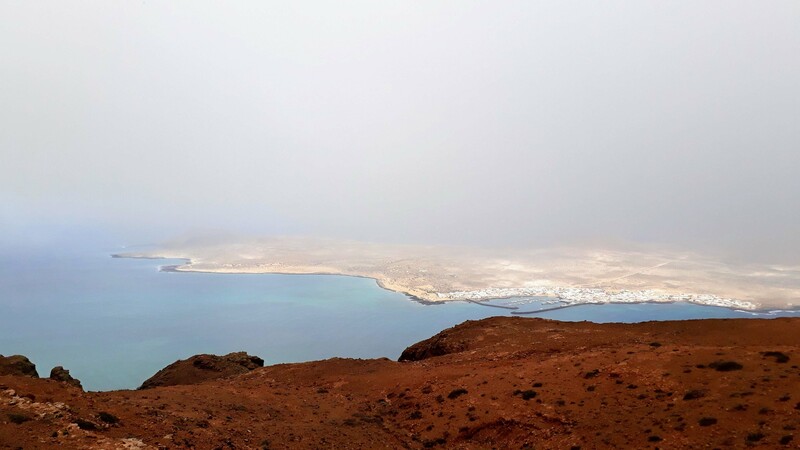 The name was given due to the strait Río (Spanish “river”), which can be seen from the viewpoint, offering a view – in appropriate weather – over the islands of La Graciosa, Alegranza, Montaña Clara and the rock Roque del Este. 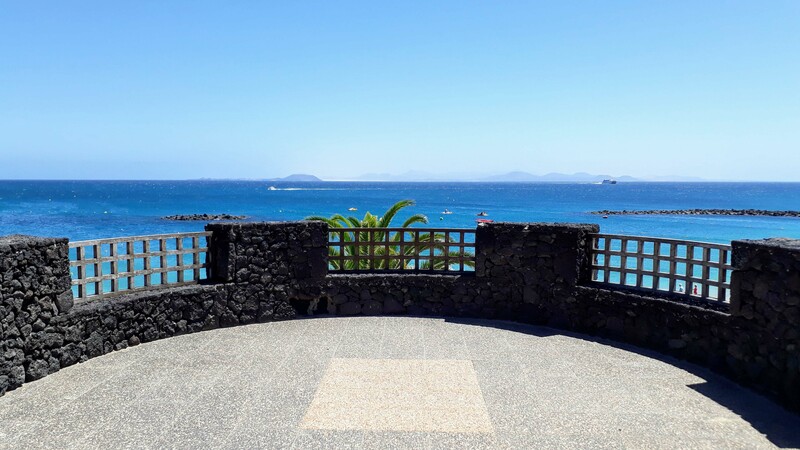 The cactus garden Jardín de Cactus was the last intervention work carried out by César Manrique in Lanzarote. Here are cactus plants from all over the world: about 4500 specimens, 450 different species from 13 different cactus families from five continents. The cave Cueva de los Verdes was created during a volcanic eruption of the Montaña Corona about 3000 to 4500 years ago. A large lava flow from the volcano Corona flowed east towards the sea. The faster cooling of the lava on the surface made for a tube formation, through which the lava continued to flow until it left a 7-kilometer-long cave after drying. The cave ceiling broke at about 20 places. At these fractures, up to 20 meters deep shafts, the so-called Jameos, were formed. The Cueva de los Verdes is only one part of the 7 kilometer long cave system, which forms one of the longest lava tubes on earth. It begins at the Montaña Corona and ends at the coast below the water surface at about 50 meters depth. Large parts are still unexplored, less than 50 percent are accessible. In earlier centuries, the Lanzaroteños sought protection from pirates. Since 1964, the cave is partially accessible to tourists. During the tour, you will reach a natural large hall with an artificial stage. Although the acoustics in this 300-seat concert hall is very good, concerts are rarely given here because an infrastructure with, for example, a bar, a restaurant and toilets is missing. Already in the 16th century the halls of the cave were described as giving the impression of being a cathedral of nature. 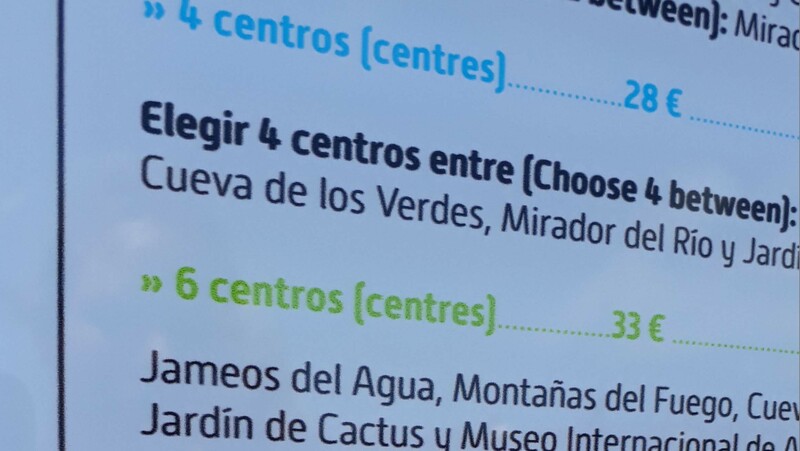 For the name “de Los Verdes” you will find different information. However, it goes back either to the name of the discoverers or the former inhabitants. The name has therefore little to do with the translation “green” of the Spanish word “verde”. The Parque Nacional de Timanfaya was declared the eighth national park in Spain in 1974. 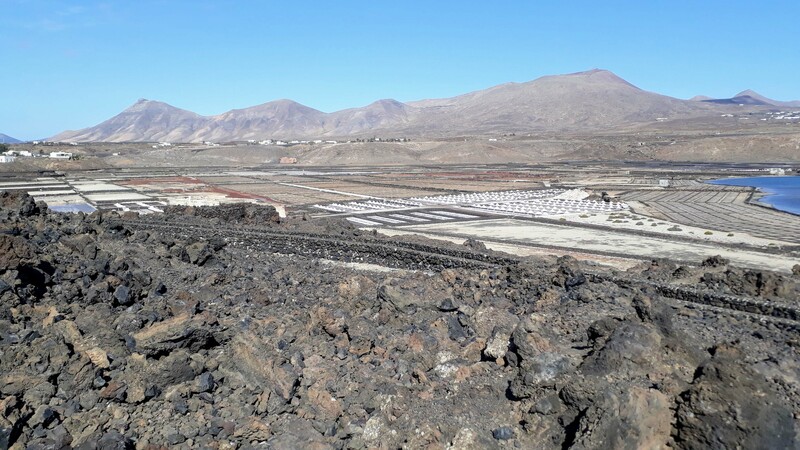 It is also referred to as Montañas del Fuego (“fire mountains”) and dates back to heavy volcanic eruptions between 1730 and 1736 in southern Lanzarote. Visitors can drive along the volcano route in special vehicles. In the middle of the moonscape in different shades of ocher, at the viewpoint Islote de Hilario, you will find the El Diablo restaurant, created by César Manrique. The highlight: The food is prepared with the heat of the volcano. Because only 10 meters below the surface the earth boils at a temperature of almost 300 degrees Celsius. This geothermal feature is caused by a magma chamber only 4 to 5 kilometers deep. The tremendous power behind this is readily demonstrated: if a little water is poured into a bottom opening, it is heated in seconds in such a way that it shoots upwards as a fountain. Admission to the visitor center of Timanfaya National Park is free. 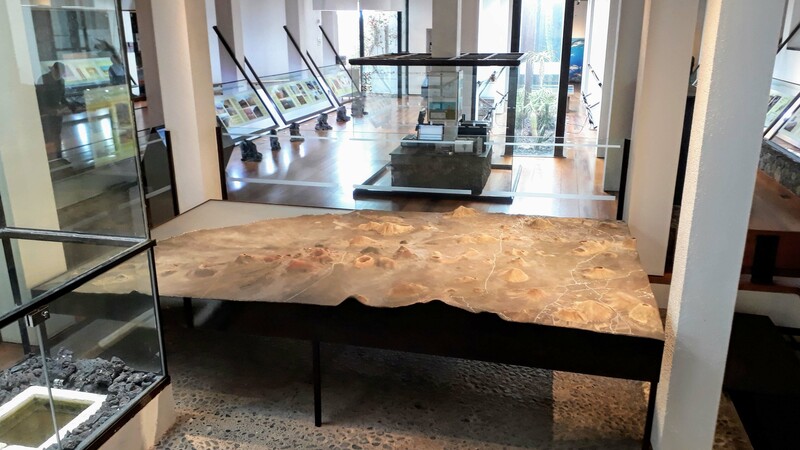 Here you can find a lot of information about the origin of the Canaries, learn a lot about the functioning of volcanoes and can even participate in an audiovisual simulation of a volcanic eruption. Absolutely worthwhile! 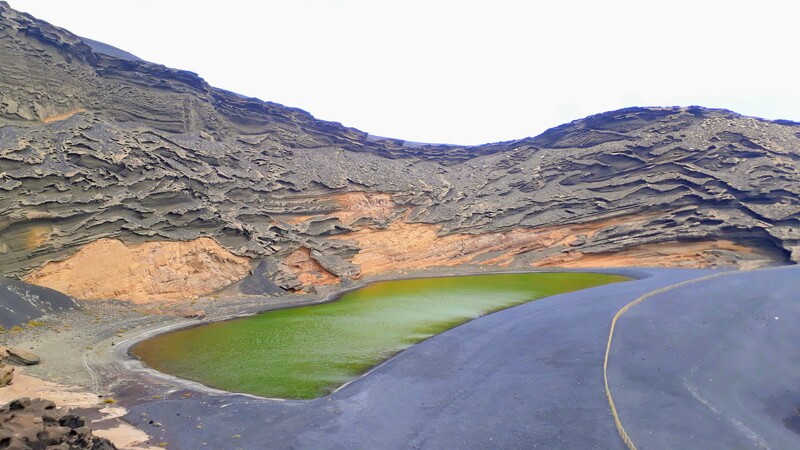 South of the coastal town of El Golfo with just 712 inhabitants is a crater of the volcano Montaña de Golfo partially submerged in the sea, in which a conspicuously green lagoon has formed. The striking color of the lagoon is caused by unicellular algae, which have adapted to the high salt content of the lake. Subterranean connections to the sea allow seawater to flow into the lagoon, providing constant compensation. This balance of nature has been disturbed for some years for unknown reasons. The now closed off green lagoon evaporates more and more and today has only a fraction of its original size. The crater lake is called Lago Verde (“green lake”), Charco Verde (“green pond”) or Charco de los Clicos. The latter name comes from a species of marine life, the Clicos, which used to be frequent in this place. 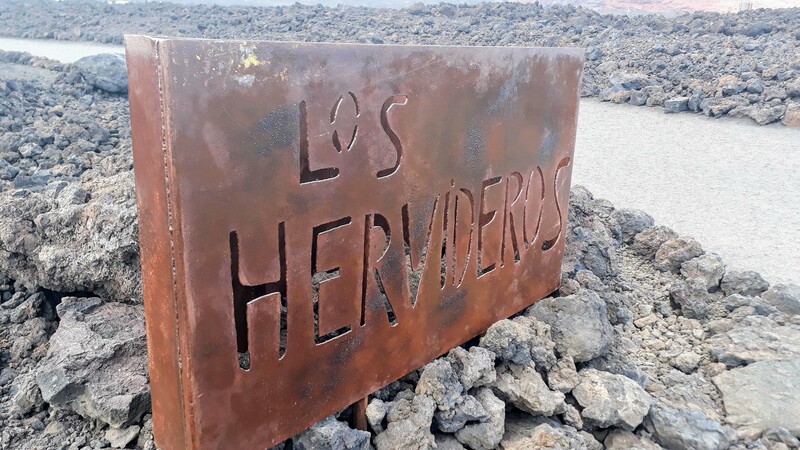 Not far from El Golfo you will find Los Hervideros: lava caves and unique rock formations caused by erosion. They were created by the confluence of glowing lava from the lava flow from the Timanfaya National Park and the sea. The natural spectacle of the roaring, foaming and surging up waves can be observed from narrow rock paths and constructed balconies. The salt fields of the Janubio saltworks can be easily seen from various viewpoints from the highway. They form the largest salt extraction plant in the Canaries. Depending on the position of the sun, the salt ponds appear in different colors, which are produced by salt-loving microorganisms, the so-called halophiles. Furthermore, salt mounds, historic windmills, partly dilapidated buildings and masonry can be seen. While driving back and forth across Lanzarote, you’ll see semicircular lava stone walls, especially in La Geria. The reserve is the largest wine-growing area in the Canary Islands. Due to the sinking of volcanic ash from the volcanic eruptions in the years 1730 to 1736, an area was created here with lapilli layers of 1 to 2.5 meters thickness. Lapilli (Latin: “little stones”) are 2 to 64 millimeters large rock fragments, which are promoted in an explosive volcanic eruption. Probably first out of necessity, a successful, special kind of dry farming developed. In order to return to fertile soil, funnel-shaped depressions were dug into the lapilla layer and a single plant was placed at the bottom of each. In the middle of the Valley of the Thousand Palms is the city of Haría. 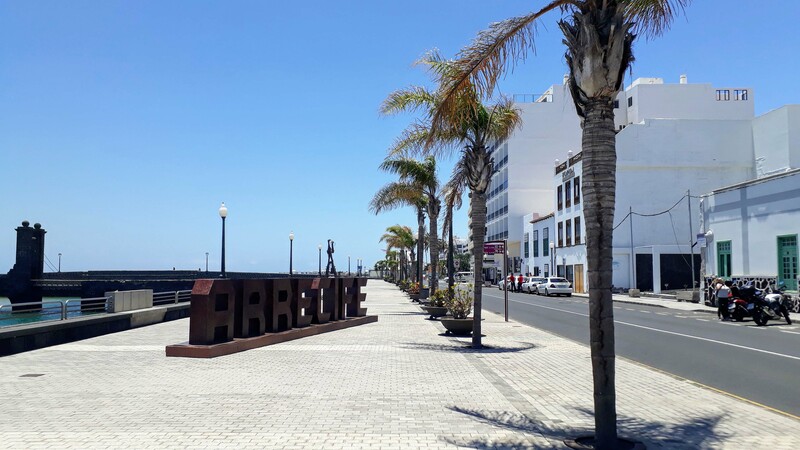 Legend has it that a new palm tree began to grow each time a girl was born in Haría. 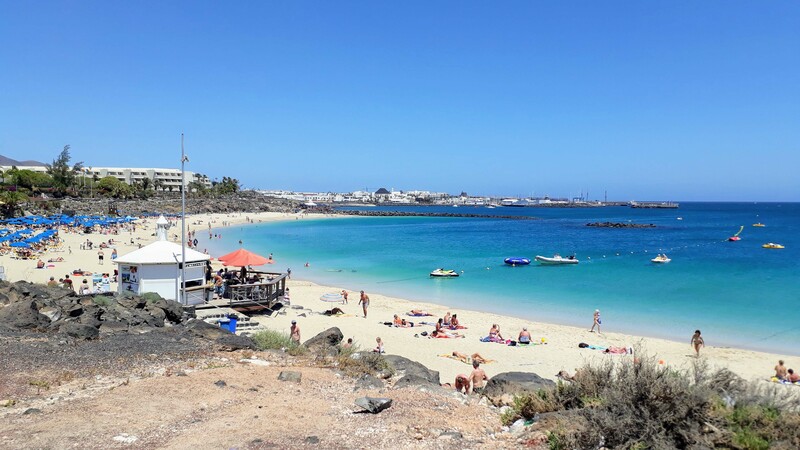 Playa Blanca (“white beach”) is the tourist resort on Lanzarote par excellence. 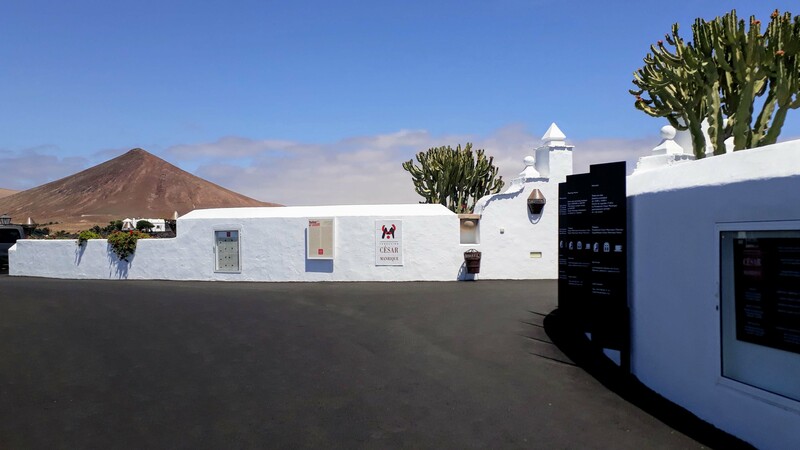 The tourist center is located in the south of the island, just opposite Corralejo in the north of the neighboring island of Fuerteventura. From the harbor there are daily ferry services, which take about half an hour to reach Corralejo. 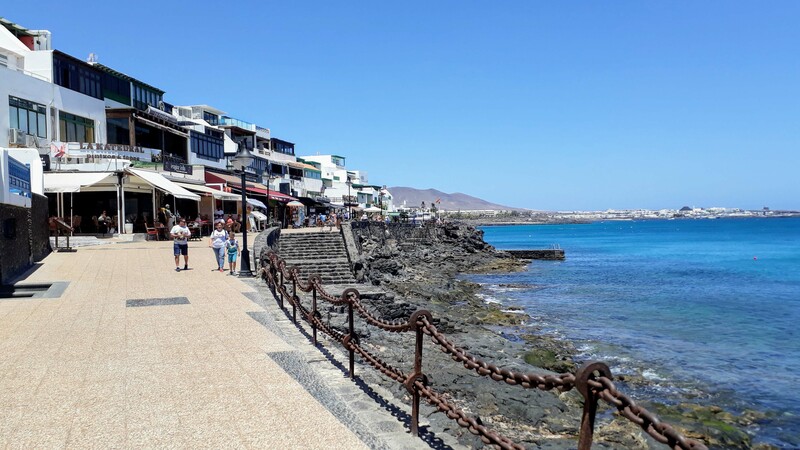 Playa Blanca has a seaside promenade with numerous restaurants, bars and shops, including the Marina Rubicon. The beach Playa Dorada (“golden beach”) is located directly on the coastal promenade and offers fine sand and crystal clear water – almost paradisiacal! You can reach them either on foot, by boat taxi from Playa Blanca or by car on sandy slopes. Since 1998, there is a ticket booth with barrier at the beginning of these slopes, where you have to pay a parking fee per car. Where previously you could drive across the terrain, now every slope is limited by large boulders for environmental reasons. From the beaches you can see the neighboring islands of Fuerteventura and Lobos. Above, on the lava cliffs between the beaches of Playa Pozo and Playa de Papagayo, there is a beach restaurant. Finally, a real insider tip from us: the bay Caletón Blanco on the eastern coast of the fishing village Orzola. Here the sandy beach is white and pure like no other in Lanzarote. A natural swimming pool with crystal clear water covers most of the landscape of sea and volcanic rock. The characterizing black lava rock, the turquoise Atlantic and the white sand provide a beautiful play of colors. 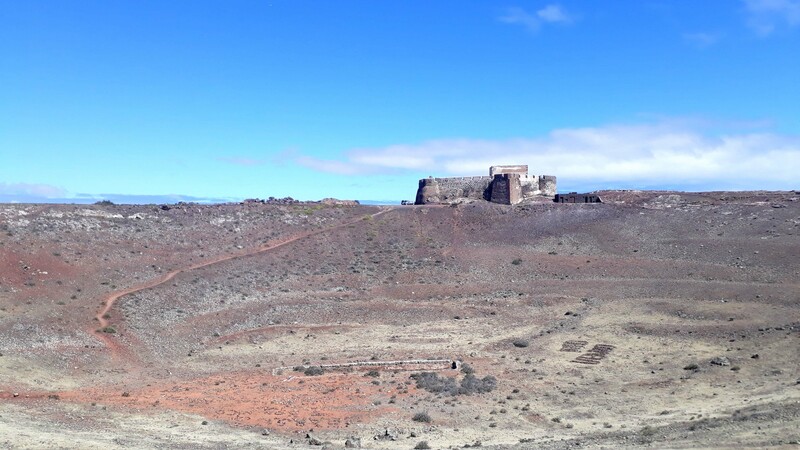 The Castillo de Santa Bárbara is located 135 meters above the town of Teguise on the crater rim of the Guanapay Volcano. It resembles a knight’s castle, has a drawbridge and small round towers. After a two-year renovation, the castle has housed an emigrant museum (Museo del Emigrante Canario) since 1991, which was set up on the basis of documents from municipal archives and former emigrants. In 2010 it was supplemented by a pirate museum. 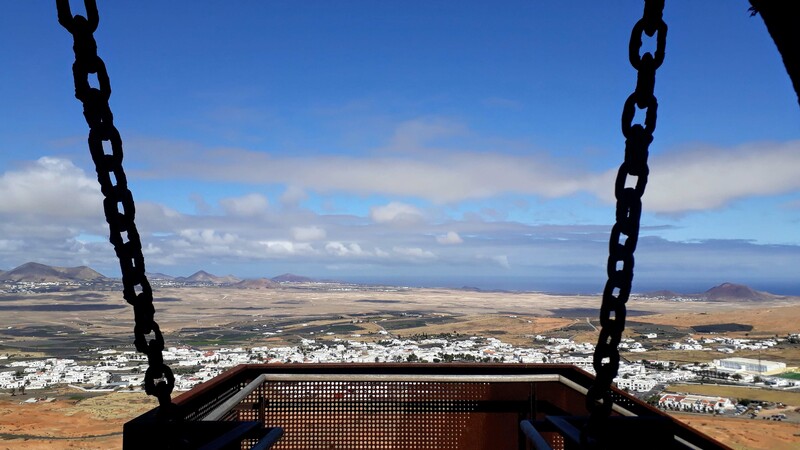 You have also a great view of Lanzarote from here. The Castillo de San Gabriel fortress is located on a small island called Islote de los Ingleses (“English Isle”), which is accessible via two dams: one for motorized traffic and one for pedestrians only. On foot you pass the Puente de las Bolas (“Ball Bridge”), a small drawbridge with two cannonballs on its pillars. Originally built as a wooden fortress, it was completely inadequate for defense purposes and was eventually burned down by Berber pirates. In the 16th century it was replaced by a stone castle, which eventually played an important role in the protection of the port and the city. The fortress was declared a national monument in 1972 and houses a small ethnographic museum. The view from here of the city and the Atlantic Ocean is great. 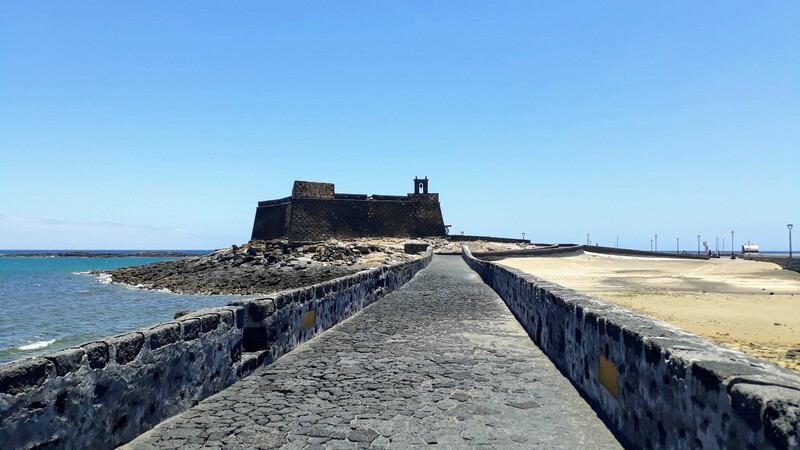 The Castillo de San José is a historic fortress in Arrecife, where since 1976, the International Museum of Contemporary Art (Spanish: Museo Internacional de Arte Contemporáneo, short: MIAC) is located. The fortress was built between 1776 and 1779 on behalf of King Charles III. It served as a defense facility for pirate attacks and as a public construction project to create much-needed jobs in times of hunger and poverty on the island. So it was commonly known as the “Fortress of Hunger” (Fortaleza del hambre). Located on a cliff above the port of Naos, the D-shaped fort has semicircular walls facing the sea. On the land side, the back wall is protected by two small turrets, with a moat being crossed by a lifting drawbridge to the main gate. The fortress consists of masonry and ashlars of volcanic origin. The interior, which consists of barrel vaulted rooms, was mainly used as powder storage. After losing its purpose of defense, it was abandoned for nearly a century. Once again, it was the local artist César Manrique who convinced the island authorities of the need to turn the old fortress into an art gallery. As you already read, the entrance to many attractions in Lanzarote is quite expensive. Therefore, there are package prices, which are worthwhile, if you intend to visit several tourism attractions. These so-called “Bono” are available for 3, 4 or 6 attractions, but in some cases you can only choose from prescribed options. Lanzarote has 27 vegan-friendly restaurants, as seen on HappyCow. Of these, 6 are purely vegan or vegetarian. Since you can find vegan options almost everywhere, on the map above we only added those that do not offer meat/fish. We ourselves did not eat out on Lanzarote, so unfortunately we can not report personal experiences. 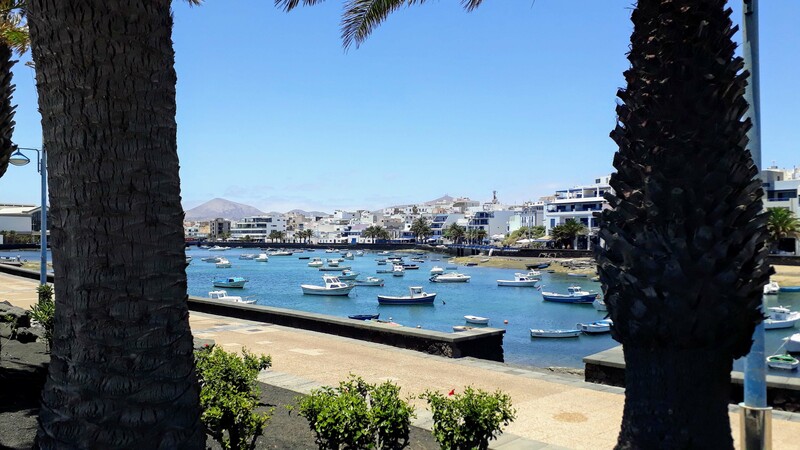 We once stayed overnight in Lanzarote: at Casa Salinas Playa in Orzola. 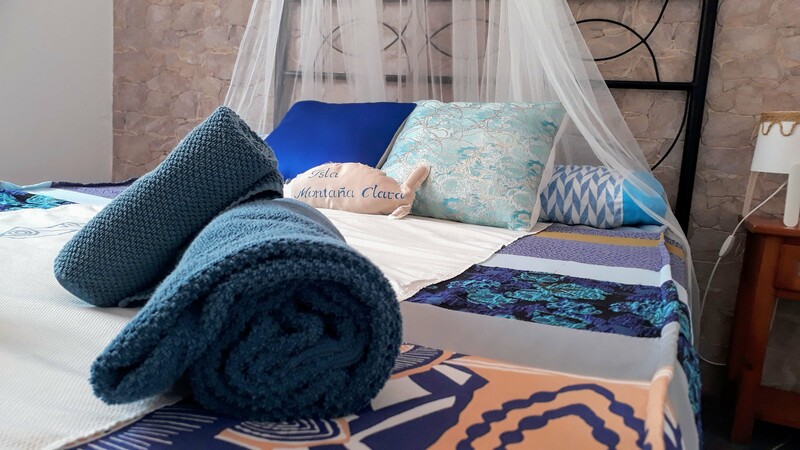 The property is located in the immediate vicinity of the dream beach Caletón Blanco, offers a large communal kitchen and is overall very recommendable. We paid 30 euros for one night in a double room with shared bathroom. Finally, we would like to recommend you a day or multi-day trip to Fuerteventura. As mentioned already, from Playa Blanca you only need half an hour by ferry to the port of Corralejo on the neighboring island. 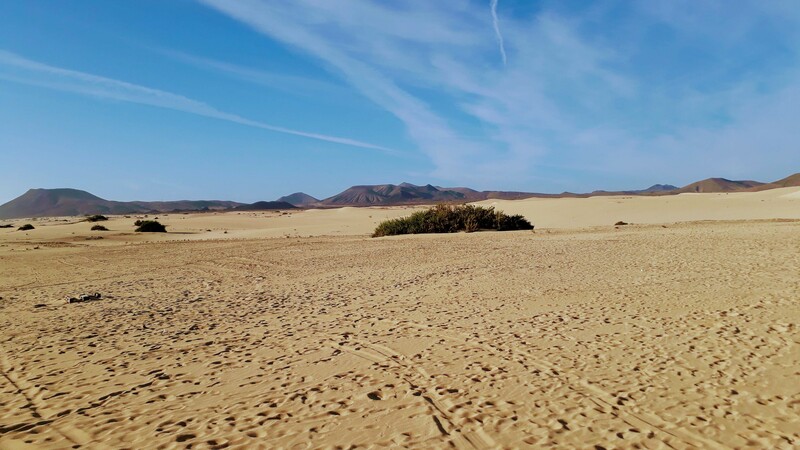 Here you will not only find a wide selection of delicious vegan food, but also the Parque Natural de Corralejo with large shifting dunes under nature conservation. 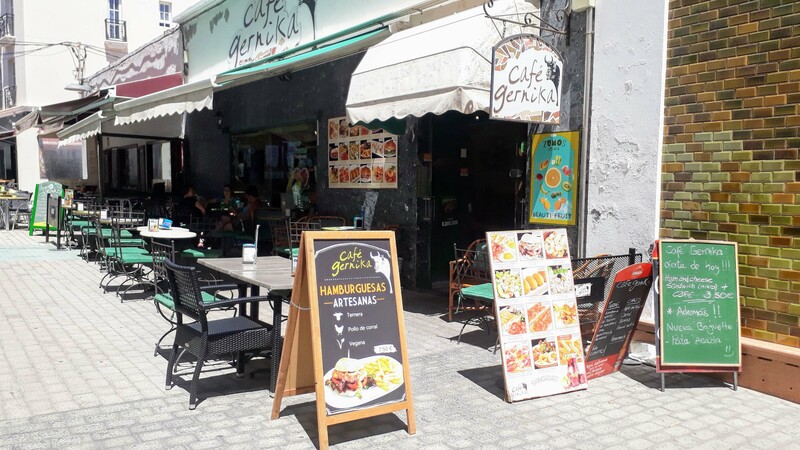 You can find all the sights, viewpoints and vegan spots on Fuerteventura in this article as well as in our Fuerteventura video. Lanzarote definitely has beautiful beaches and teaches you, if you want to, a lot about volcanology. But that’s not all: Even if the entries are quite expensive, no one less than César Manrique has personally immortalized himself here on the small Canary Island. If you want to see everything, it’s best to use the Bono entry packages. Oh yes: If you would like to be able to move flexibly on the island, it makes sense to book a rental car.